Heat oven to 425°F. Spray mini doughnut pan with cooking spray. In medium bowl, mix all doughnut ingredients with spoon until blended. Spoon batter into pan, using about 1 tablespoon for each doughnut. Bake 6 to 8 minutes or until toothpick inserted near center comes out clean. Remove doughnuts from pan to cooling rack; cool 5 minutes. Meanwhile, in small bowl, mix glaze ingredients with whisk until smooth. 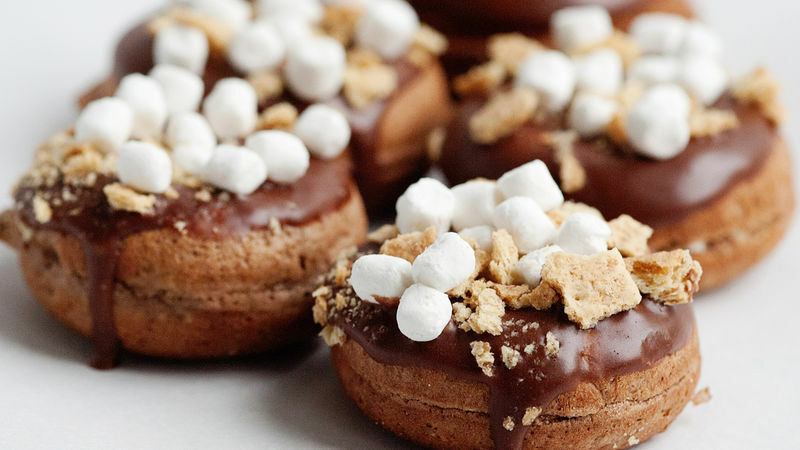 Dip tops of doughnut tops in glaze; sprinkle with graham cracker pieces and mallow bits. Serve warm. If you can’t find mallow bits, cut mini marshmallows in half. To easily crumble the graham crackers, place in a resealable food-storage plastic bag and coarsely crush with a rolling pin or meat mallet.